Looking for a ridiculously simple and delicious topping for your ice cream, parfait, or frozen yogurt? These Balsamic Mixed Berries are out of this world and take zero effort. Today’s post is going to be super simple. Actually, I can’t even believe I’m calling this a recipe. It only involves a couple ingredients, and you do nothing besides mix and let marinate. As I was planning posts for this week, I knew I needed something quick and easy. See, if you’re reading this on Friday, I’m either up in the clouds or I’ve already landed 2000 miles away from home. There’s no time for something elaborate and fancy. Plus I thought this would be perfect for a Memorial Day gathering. 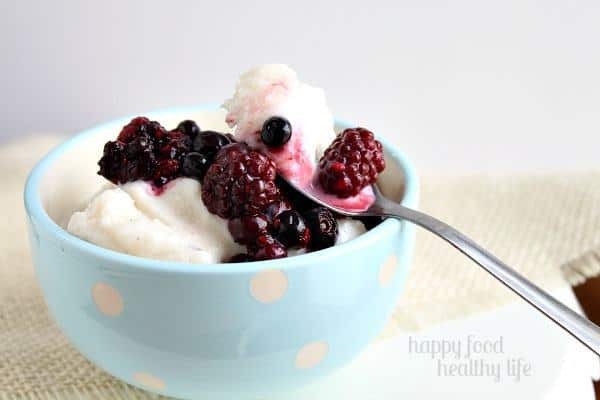 A perfect topping for your vanilla ice cream or if you’re feeling like going the healthy route, you could top these berries on my super easy Vanilla Bean Frozen Yogurt. Oh, and in case you’re wondering. I’m finally visiting my wife this weekend! I haven’t seen her in forever! She’s been away on military duty for four months now, and it’s seriously been the longest four months of my life. I did visit her two months ago, but really it’s just been DRAGGING! Thank goodness I have the opportunity to get away and stay on base with her for a few days over the long weekend. But let’s back up a bit. I am writing this at 5:47 AM on Thursday morning. And my anxiety is through the roof! I generally don’t stress about travelling. But for some reason, I am kind of freaking out this time around. About All.The.Things. Everything. For one, my super short layover from Dallas to Wichita Falls. Having to get off the plane, switch terminals, pit stop at the potty, and make it onto my connecting flight within 40 minutes. Not my cup of tea. I don’t know this airport, and as much as I’ve studied the map and the shuttle system (yes, I’m that kind of person), I’m still nervous. Maybe I’ll get lucky and my flight in will be slightly early. Just please do not let it be late. + I haven’t started packing at all yet. + I have to schedule 5 days worth of Pins (that’s about 300 pins total…), Facebook posts, and G+ posts. + I would love to get one more good workout session in this evening. + I have to pick up my son’s inhaler prescription refill at some point before taking him over to his dad’s this evening. Oh, and this all has to get done AFTER my 8-hour workday today! Bring on the caffeine and sleepless night ahead! Thank goodness for easy treats like this one. It literally has about 30 seconds of hands-on time. Then you walk away for 30 minutes and the berries are perfect to top your ice cream, yogurt parfaits, or whatever else you may desire. The balsamic vinegar seems like such a strange pairing for mixed berries, but my friends… it is AMAZING. 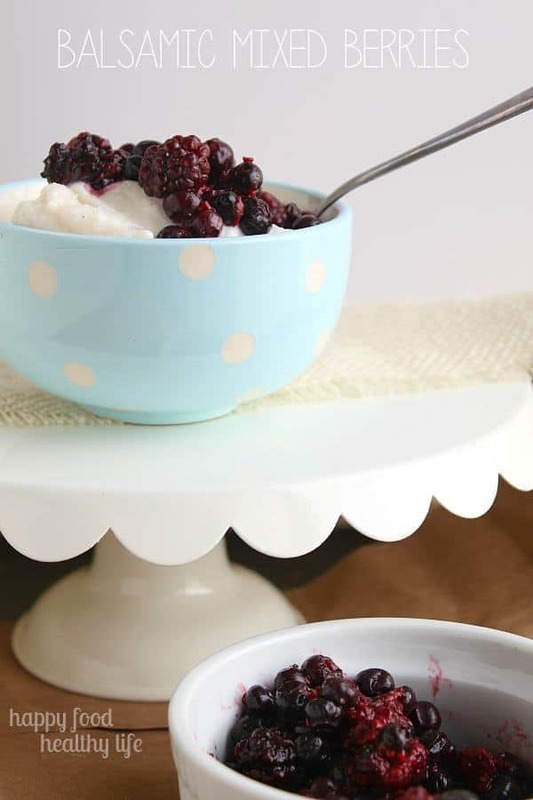 It brings out the sweetness of the berries and really gives it a new layer of flavor. I’ll be honest. I was nervous. I had no clue how it would turn out. But I was very pleasantly surprised. And you will be too! Make sure berries are completely washed. Combine balsamic vinegar with the berries, mixing well. Let sit for 30 minutes in the refrigerator. Drain the berries after 30 minutes. Do not rinse. Serve over yogurt, ice cream, frozen yogurt, etc. I love balsamic with berries! This looks so good, Holly! Thanks Kayley! 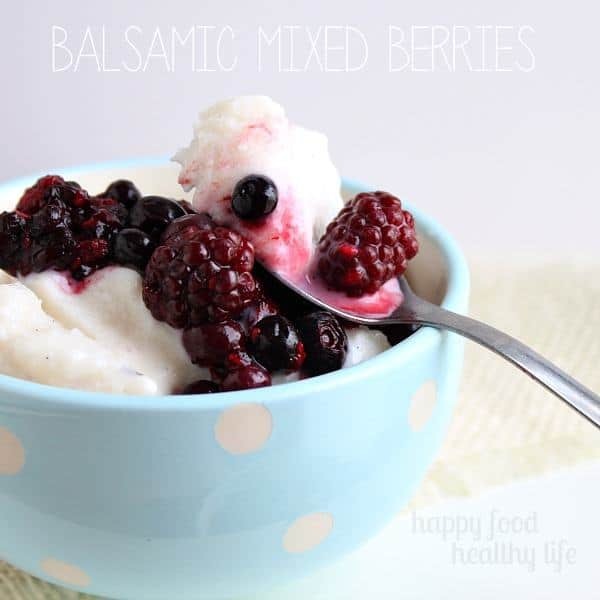 I didn’t know what to expect with the mixture of balsamic and berries, but I just love it! I love berries and balsamic vinegar…this sounds delicious! The combination is unexpected, but sounds tasty to me. Thanks for sharing! Totally unexpected, and when I first heard that it was a thing, I was totally grossed out, but still super intrigued. So I tried it, and I’m in LOVE! Thank you so much Susan! I really appreciate it. it’s definitely an unexpected ingredient!